The album opens with “A Thud” – a wonderful throwback to the bands I listened to in my younger days. “A Thud” really has that 90s third wave ska feel to it. There are certain influences from the classic Zeppelin track “D’yer Mak’er” and the reggae infused punk rock tunes of The Clash built into the very fibers of the song’s DNA. From the moment this song picked up, I knew I wasn’t going to be stuck listening to yet another hipster act with the same sound and style of every other band out there. The next track immediately lets the listener know that the influences on the album are diverse and that Marty Thompson is no one trick pony. With a classic rock feel, a modern rock sensibility, and just a hint of outlaw country flair, “Devil’s Bridge” is much different than “A Thud”; yet, it feels equally powerful and… well… fun. 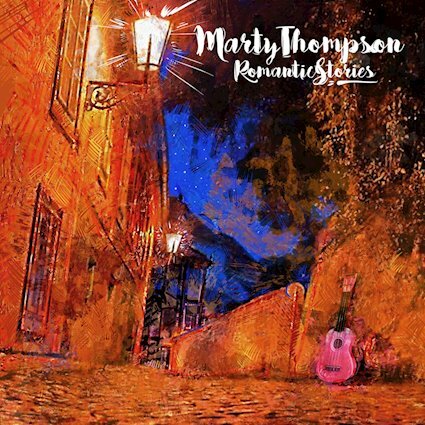 As Marty Thompson’s new album – Romantic Stories – rolls on, it quickly becomes apparent that the album was written to be fun and upbeat. This isn’t a depressing lament or a deeply contemplative tome. Instead, this is a free-wheeling good time album with thoughtful lyrics and toe-tapping beats. As the third track – “Face of God We Climb” – and fourth track – “In the Monk’s Garden” – played for the first time, I couldn’t help but think of some more comparisons and influences. Last year, we lost the incredible Tom Petty, but Marty certainly hasn’t lost the ability to craft a Petty-esque melody. This is one of the influences and comparisons that comes to mind most. While I cannot confirm that I’m right, I suspect that Marty was and is a big fan of Tom. The comparison to Petty doesn’t dissipate after those two tracks, nor does it on subsequent listens of the album. There’s a clear similarity in the spirit of Marty’s songs. Yet, there’s something about the tracks that make them distinctly different, too. Marty has a unique voice and unique style that blends in many different influences to create a “beautiful sound” just like the “small bird” in “Wünderweg”. We could certainly break the album down track by track to look at the variety of different instruments, blended genres, and interesting melodies used in each. However, this is an album that really doesn’t feel best consumed as an album. Each track has its own feel, yet they work together to really create an overall feeling that is pleasantly upbeat and lighthearted. Fans of classics like the Allman Brothers, Tom Petty and the Heartbreakers, and Crazy Horse, as well as modern acts like Wilco and Shooter Jennings, will all find a lot to love in Romantic Stories. In fact, I’d argue that Marty’s new album is one that can unite folks like me (who mostly listen to punk rock and the harder side of rock) with folks like my sister (who’s favorite band is Zac Brown Band and likes a ton of pop country that I loathe) with something we can listen to together and share a common affection for. Music that a variety of different folks can truly enjoy is definitely a blessing to this world! For more from Marty, check out his website, Facebook, Instagram, Twitter, Soundcloud, and YouTube. He’s got the album streaming on his site now, so you don’t have to take my word for it when I tell you that it’s damn good.